Baton Rouge, La.-based Rotolo’s Pizzeria debuted its third location — and its new prototype. Located in the restaurant chain’s hometown, this marks Rotolo’s 23rd location in Louisiana and the 31st system wide. The 4,500-square-foot Craft & Crust prototype also serves as the brand’s flagship restaurant. The location debuted a revamped menu, 34 beers on tap, and a restaurant design that features a Slice Bar where during lunchtime pizza chefs cut slices to order, providing just a sliver or a bigger helping, per the customer’s direction. The full-service restaurant features seating for 155 that includes a bar, booths, tables and an open-air patio. 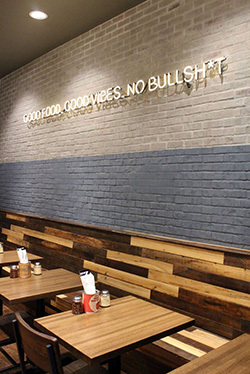 With a mix of wood and brick, the chain drives home its message of authenticity. A neon sign boasts “Good Food. Good Vibes. No Bullsh*t”. The expanded menu offers 13-inch “stone-crafted pizzas” cooked at 600 degrees F in an Italian deck oven. The new menu also includes a variety of salads, hot and cold sandwiches, Italian entrées and calzones.